Clean, wash and soak the rice for about thirty minutes. Take off and finely slice the onion. Heat up grease in a thick bottomed pot over a medium heat. Mix in cardamoms, cloves and cinnamon. Stir fry for half a minute. Mix in the cut onions and fry until lightly browned stirring frequently. Mix in coriander powder and fry for one minute. Mix in cinnamon powder, clove powder and red chilli powder and fry for half a minute. Mix in drained rice, cauliflower florets, green peas, sweet corn and salt. Stir fry for two to three minutes. Mix in the coconut milk and warm water, mix in to rice and bring to boil. Cover the pot tightly, lower the heat up to very low. Stir fry for ten minutes without lifting the lid or till done. 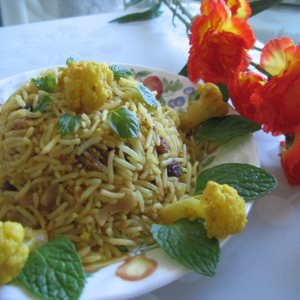 Serve decorated with cut coriander leaves.